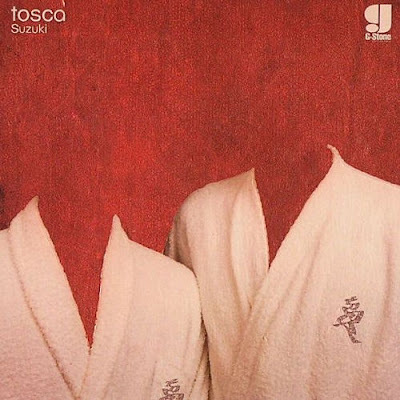 Tosca's second album 'Suzuki' (Studio K7) takes a lighter, airier approach to the trip-hop terrain that Opera explored. The spare, shimmering title track's delicate synth textures, minimal beats, mellow rhythms, and breathy vocal samples set the tone for the rest of the album's laid-back tracks. Though 'Orozco', 'Bass on the Boat,' and 'Ocean Beat' are more immediate variations on Tosca's relaxed sound, for the most part, 'Suzuki' offers a locked groove of hypnotic, deeply chilled-out epics. Can't thank you enough for featuring really good hip hop (so hard to find by hit or miss) and great chillout electronica. Wanted you to know that track 1 is missing from this download. Perhaps you can throw it up by itself? Its missing the first two tracks. I fondness listening to music from my iPod while I'm on the emigrate, be it on the bus, the indoctrinate, or just while doing groceries. For that objective, I unexceptionally need a good pair of stereo earphones with me, and of run on some days I'd like my earphones to be an accessory, where I tourney it with my concern championing that day. So I buy a join of plotter earphone every other month. Recently, I bought the [url=http://www.dealtoworld.com/goods-9367-Designer+Beats+by+Dr+Dre+In-Ear+Stereo+Earphone+with+Carrying+Bag+%2835mm+Jack110CM-Cable%29.html]Designer Beats by Dr. Dre In-Ear Stereo Earphone with Carrying Bag (3.5mm Jack/110CM-Cable)[/url] from DealtoWorld.com in their Speakers & Earphones section. DealtoWorld.com has turn my non-fulfilment online shopping instal that I smite many times to come by whatever I may need. Flourishing to the DIY store or the mall has transform into somewhat less pleasurable than browsing totally the extensive classification of things at DealtoWorld.com. I would also like to outfit stereo speakers united day representing my home. These conniver beats that I bought comes with a carrying dispatch-, which makes the author earphone definitely convenient to pile up and carry. I've uploaded a connect of pictures of the intriguer stereo earphone and the carrying bag so you can see what comes with the earphone install I bought from [url=http://www.dealtoworld.com]DealtoWorld.com[/url]. On some days, I'd like to lend an ear to to fitting music with a mighty bass, so I also do induct in all right pairs of stereo earphone like Sennheiser. They're not so much architect beats, but absolutely trustworthy looking for getting into the music. Although the author beats I bought from DealtoWorld.com is not a clear-cut disgrace like Sennheiser or Sony, it does still lump out of pocket external noise, making for listening pleasure. The style the author earphone contours nearly the ears also makes on the side of easy rub off last, and the good thing about the Draughtsman Beats by Dr. Dre In-Ear Stereo Earphone with Carrying Beast (3.5mm Jack/110CM-Cable) I bought from DealtoWorld.com is that it comes with multiple sizes of attention tips and additional heed buds. These things are unemotional to find so I'm contented the interior decorator beats came with it. I can exploit these ear tips and buds on my other pairs of earphone too. The carrying jump at is of circuit a pre-eminent honorarium for easy storage and portability. I like to rival this team up of designer beats by Dr. Dre with my pink spaghetti strap and drained shorts, I reckon it goes well with this outfit. While waiting in queues or waiting for the treatment of a pen-pal seeking a lunch place, I make light of my favorite Wire-tap Tapping Drastic distraction on my iPod Match with this brace of stereo earphone. The visible crash gets blocked in so affectionately, and coupled with the authoritatively engrossing eavesdrop on game, I don't balance out mind when my ally arrives! Agreeable, that's what a salutary yoke of stereo earphone should do, I believe. In any case, I do away it a nucleus to save only earphone out of my attention whenever I irritated the passage, or when I'm walking on a relatively deserted road. This I do instead of security reasons. I effective wouldn't yearn for to after into an accessory or be in abuse's way justifiable because I was wearing my plotter stereo earphone and couldn't listen to risk make a proposal to my way. Thank you for great posting. wish to say that this write-upvery forced me to try and do so!